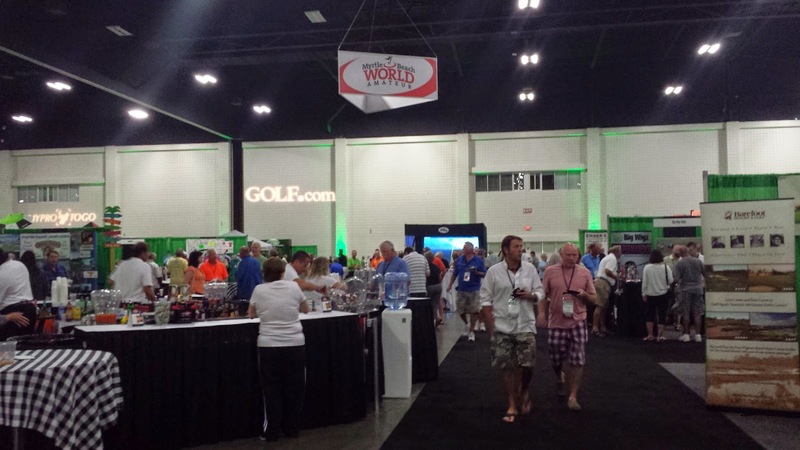 Thirty-four countries and fifty-eight states know where the largest and most fun 19th hole is in golf... do you? The Myrtle Beach World Amateur Handicap Championship of Golf - one of the most anticipated and swinging events of the year at The Beach - has over thirty-four hundred (3,400) entries that love competition and camaraderie of the sport. Since this is a handicap event, all ages and skill levels are encouraged and welcomed to join in this family event. The more than sixty golf courses on the World Am roster are the pride of South Carolina and are among the best in the USA. From Caledonia Golf and Fish Club, number twenty-seven in GOLF Magazine‘s 2014 “Top 100 You Can Play” to Myrtle Beach National and Carolina National, if you have never played golf on and around the Grand Strand, this is a great opportunity to see what this vacation destination has to offer golfers of every age and ability. After a day on the links, participants converge onto the 19th Hole - an experience, I heard, that you have to see to believe...and so I did! The 19th hole, also known as the largest golf tournament party, adjourns nightly after entrants have had their fill of birdies, bogeys and beautiful scenery playing golf on one of the host courses. 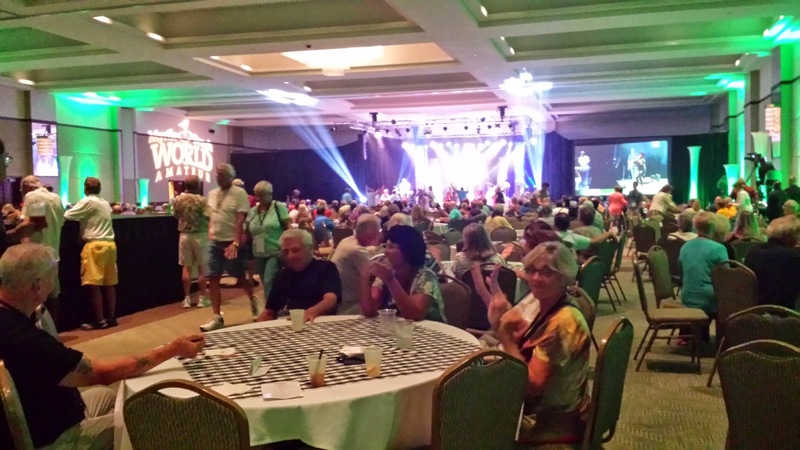 So, what happens when thousands of party-loving golfers from millennials to seniors converge during a week-long super-extravaganza event at possibly the largest ever 19th Hole in the World and in no other place than Myrtle Beach, a City known for its golf courses and fun, beachy atmosphere? Aside from the delicious and plentiful food provided by local restaurants with a different menu nightly, live entertainment and the Dark and Stormy's, you get the camaraderie of golfers sharing their day's good and bad shots, an array of putting greens, driving booths and anything and everything designed to make this a golfer's after-hours paradise. Lessons from Golf-Tec teaching pro Trent had me hitting straight and removing that annoying left pull by showing me a video of my golf swing right on his smartphone. Announcers WinMcMurry and John Maginnes were on hand to call the shots on a 50-yard par-3 and I didn't know whether to play the Golden Tee games that were lined up or to hit a few into the golf simulator - so many choices but luckily there is an entire week to enjoy the fun. The best part of my experience, however, had to be chatting with the players, many of whom return year-after-year. I asked several folks if it was the golf or 19th hole that kept them coming back for more and, I was told, both were hard to beat! 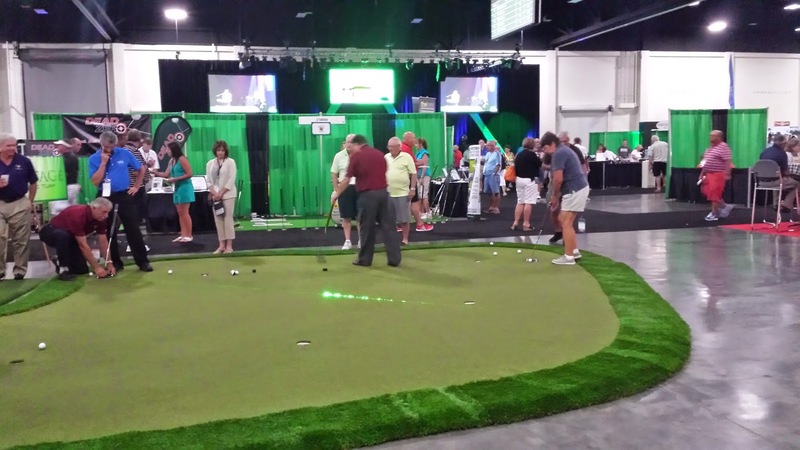 Have you attended the Myrtle Beach World Am Handicap Championship? 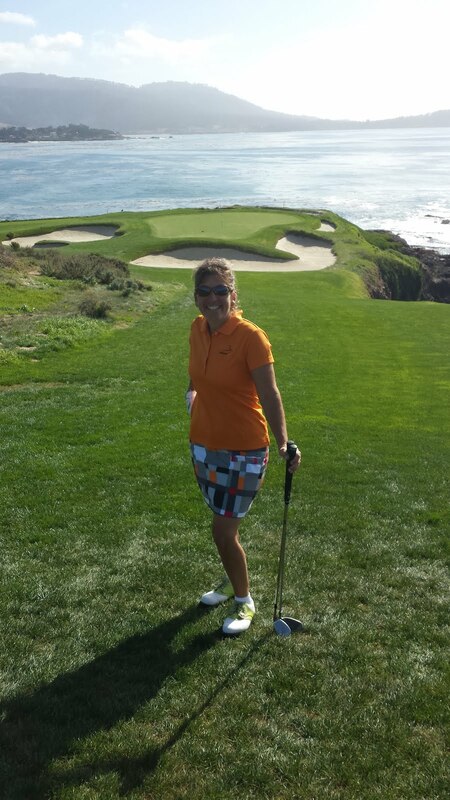 Which was your favorite golf course...or was it the 19th hole that took center stage? 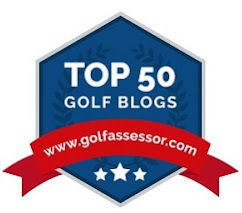 Voice your opinion on Twitter @Golf4Beginners and on our Golf for Beginners blog. Will Millennials Save or Squash #Golf? According to news articles, golf course owners and even sports equipment manufacturers, a lack of golf popularity is caused by a drop in participation by Millennials. These eighteen to thirty-year old's seem to value iPhones and computer tech more than a good walk in the park. Can kids from the Gen-Y generation find happiness playing the sport that lasts a lifetime while retaining some of its traditional elements? Robin Williams must have had millennials on his mind when he created his comedic skit on golf, with the excerpt "go whacking away with a tire iron...and each time you miss you feel like you’ll have a stroke. 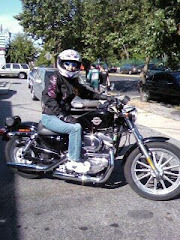 That’s what we’ll call it, a stroke, cause each time you miss you feel like you’re gonna fracking die." Millennials seem to want a more fun and reactive game and golf is a game that you play within yourself. Obviously Rory McIlroy is helping the game by bringing a fresh, young face to a new generation but is that enough? Course rounds are showing the decline - according to TaylorMade President Mark King, rounds for the new generation are down thirty-five percent in the last ten years. With that, golf courses are falling upon hard times with closings totaling one every forty-eight hours! Should people blame Millennials for this affliction or should the golf course discussion be about the financial bubble which burst ten years earlier? Nope, Gen Y'ers don't want that much of a challenge, the mindful struggle to get a small white ball into a tiny hole; they want fun and ease...no challenges that cause distress. 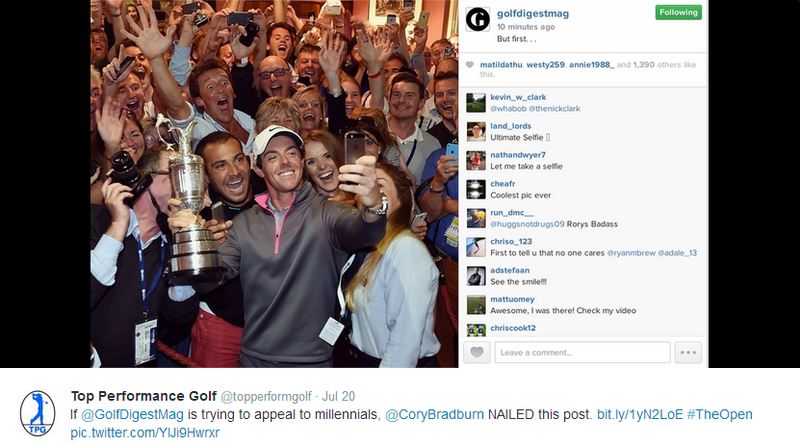 Enough talk about what they don't want...what do Millennials feel is necessary to enjoy golf? This enigma is what organizations are struggling to figure out; is it the end of having to "belong" to a golf club, is it too expensive, do they want more fun...or a quicker round? Bryant Gumbel's commentary on HBO Real Sports discussed ways in which Gen-Y'ers are currently enjoying golf courses, driving ranges and, basically, making the sport their own. - Foot golf - A mix of soccer and golf where folks kick the ball around into a larger hole. - Top Golf - a blend of driving range with microchips in golf balls, night club entertainment and a bit of friendly digital competition. 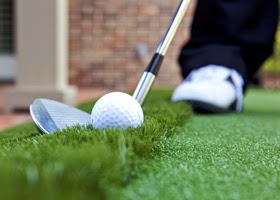 - Easier scoring for golf beginners. - Free beer on Saturday's? Golf for Beginners has also come up with a few ideas to enhance the game for multi-generational sports fans - how about softball golf or hockey golf? They'll be tearing up the course with these blended sports but, if it brings players into the game, isn't it worth it? Golf may be going through growing pains but, in my opinion, is not doomed to aged traditionalists who want to keep folks out, not bring them into the game. I think the game of golf is safe because millennials will eventually get older and want to enjoy a more conventional sport - so many women enter the game as they mature and enjoy the cameraderie and challenge. The current concern with Generation Y is to get them interested early so that they are ready for the challenge when they have kids. Are you a Millennial? Do You Play Golf? Voice your opinion on Twitter @Golf4Beginners and on our Golf for Beginners blog. New golf clubs but no where to put them? The dilemma of purchasing a cart bag versus a stand bag basically comes down to meeting your needs on the course. Here are a few tips to help you make the right choice. When I agreed to participate in the PGA Tour Superstore Custom Fit Event to be professionally outfitted with a set of golf clubs, I was sent a large box with the latest Ogio Giza Cart bag inside - a big and unexpected surprise. My initial response was, "What am I going to do with a cart bag?" at the same time deciding whether or not I should contact the store to switch to a stand bag. My husband said that we should keep it - fill that large, elegant Ogio with my new clubs (a set of Ping Karsten irons, a Callaway X2 Hot Driver and my wonderful Vokey Spin Milled Wedges.) Since that time, I have not removed my golf clubs from the cart bag and I have received compliments on the range. - I ride in a cart during the hot summer months. - When I begin to walk the golf course again in the autumn, I will probably be pushing a cart, not carrying my clubs. 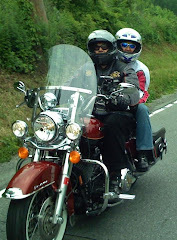 - The larger bag comfortably accommodates all of my golf clubs - no struggle placing the clubs back into the bag. -Heavy Duty with all of the bells and whistles (Insulated Cooler pocket, full length club dividers, 15-way cart top with putter pit for oversized grips). Livestrong.com says that Golf Bags review "suggests that many players who choose cart bags prefer the look of the larger bags because they most closely resemble what the pros use, rather than any functional consideration." Most carry stand bags are lightweight however most golfers pack their bags with much more than they need for that round of golf making the carry bag, in some cases, heavier than a stand bag. -Golfers who walk the course and know how to keep their bag light. -Driving Range aficionados - easier to take to the range. -Balance - has two built-in legs for better balance when you place the bag on the ground. 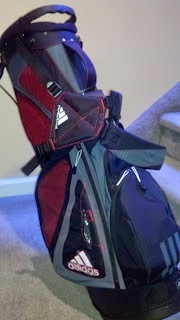 While I still have my Adidas Golf Strike aG Stand Bag ready for a quick switch, I have not had to use it...yet. 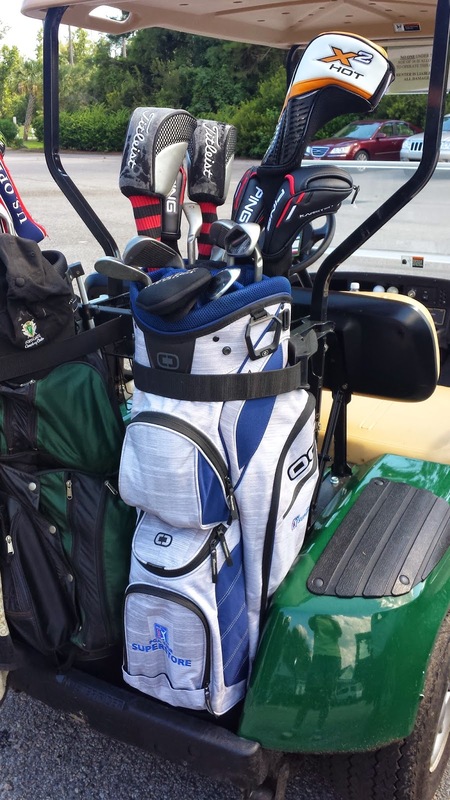 The Ogio Cart Bag has features I am not ready to give up and riding in a golf cart during the blistering summer months also has it's advantages! Voice your opinion on Twitter @Golf4Beginners and on our Golf for Beginners blog. To Chip or To Putt? A Golf Dilemma Answered! Your golf ball lies on the fringe of the green with the pin forty feet in the distance - you're scratching your head... are you going to pull out the putter, a pitching wedge or a 7-iron? You want to keep the ball low for the best results. Arnold Palmer mentioned that a low ball means a lower risk - your worst putt may probably be much better than your worst chip. Although you can strike the ball with any club in your bag, Golf Tip Reviews writes that amateurs "should putt whenever they can. It will save you strokes on the golf course." Dave Pelz suggests a unique idea - the "Chiputt" for very long putts. "The longer the putt, the more likely you are to leave it short, because your stroke (and everyone else's) naturally evolves to favor accuracy over power. You can overcome this tendency by adding a chipping motion to your putting stroke-think of it as 'chipping with your putter.'" Dave goes on to say, "On super-long putts, stand upright for a better perspective on distance, and then putt with the same body motion you use to chip with a 5-iron. On 75- to 110-foot putts, every golfer I've tested, including Tour professionals, lags closer to the hole with the 'chiputt' method." A few more creative ideas for using a putter during a game? When should you opt for a golf club other than your putter and still keep the ball low? When you have to go over bouncy, rough ground. When there is an obstruction like a sprinkler head on your putting line. You may not want to putt when the green is very elevated above your ball position. The iron, wedge or wood you choose depends on how far the cup is from your position. The further the distance, the lower number club you use. For example, if the pin is close, you might use a pitching wedge - if the pin is very far, you would perhaps choose a 5- or 6-iron (as Dave Pelz explains above). You should definitely practice these techniques on an outdoor putting green before you play your round of golf. You'll please yourself and amaze your golf buddies!